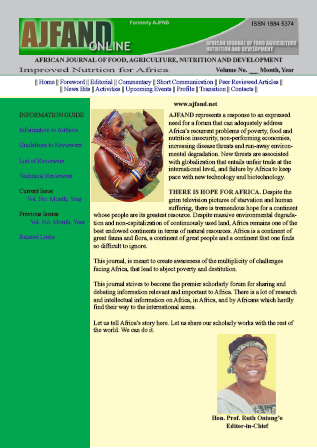 The African Journal of Food, Agriculture, Nutrition and Development (AJFAND) is a peer reviewed journal. The journal is envisaged to enable dissemination and sharing of food and nutrition information issues on the continent. It taps social science, biochemical, food and nutrition related research and information. It also addresses issues related to agriculture, food security, and nutrition that affect Africa's development and people's livelihoods. It targets and is intended to serve the research and intellectual community; African and international non-governmental organizations (NGOs); African and development oriented bilateral and multilateral agencies; and African public institutions working towards solving food and nutrition problems and addressing issues on the African continent. AJFAND is open to both African and non-African contributors. Besides academic research, the journal provides an avenue for sharing information on national-level food and nutrition programs. It is anticipated that four issues will be produced every year, with each issue combining research, programs and policy aspects.